Humans said we need to head home. Horrible words to duck ears while enjoying a road trip. But, one more stop they promised. 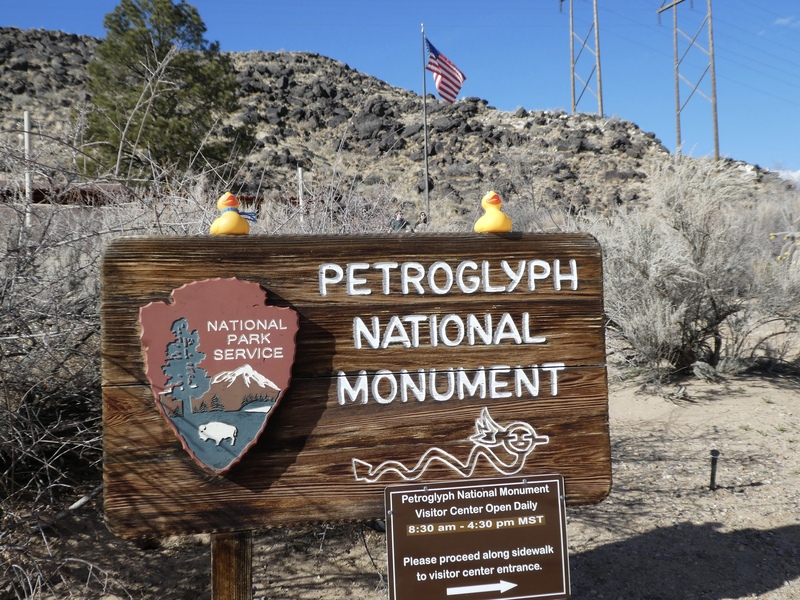 Petroglyph National Monument in Albuquerque, New Mexico. 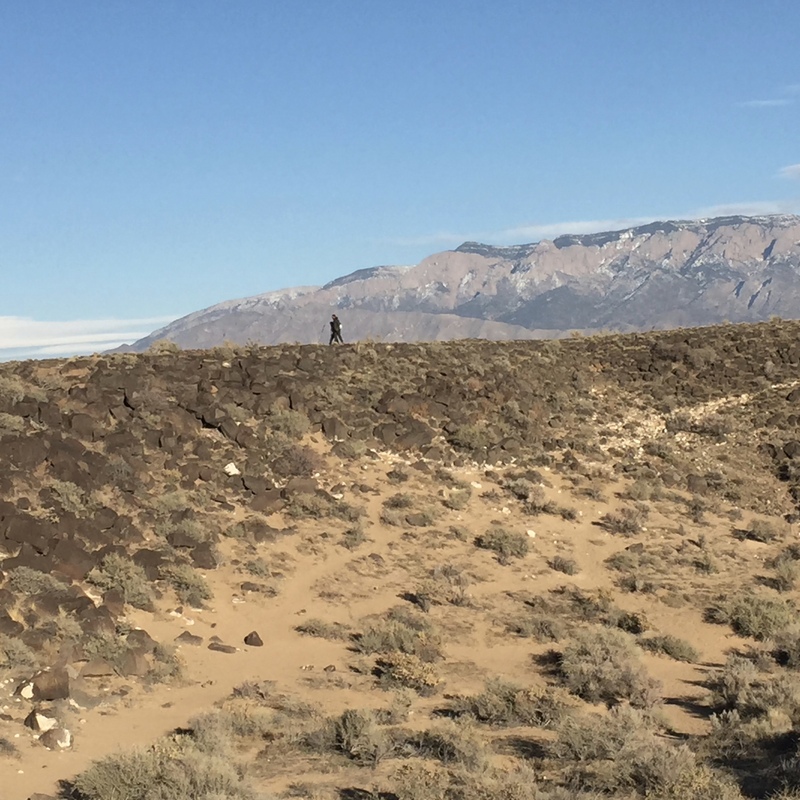 Remember, much of New Mexico is desert. 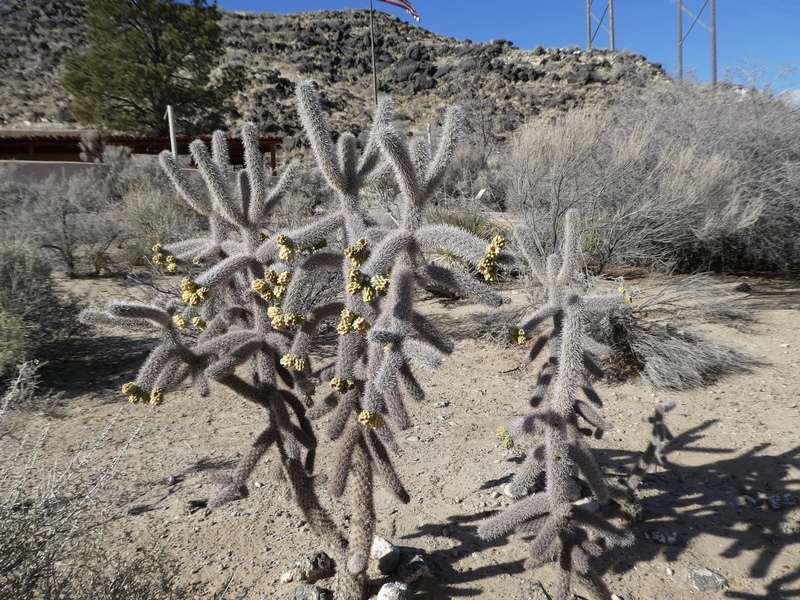 But with enough moisture, cacti do have flowers. We love blooms on this cactus. First stop was the Visitor’s Center, of course. 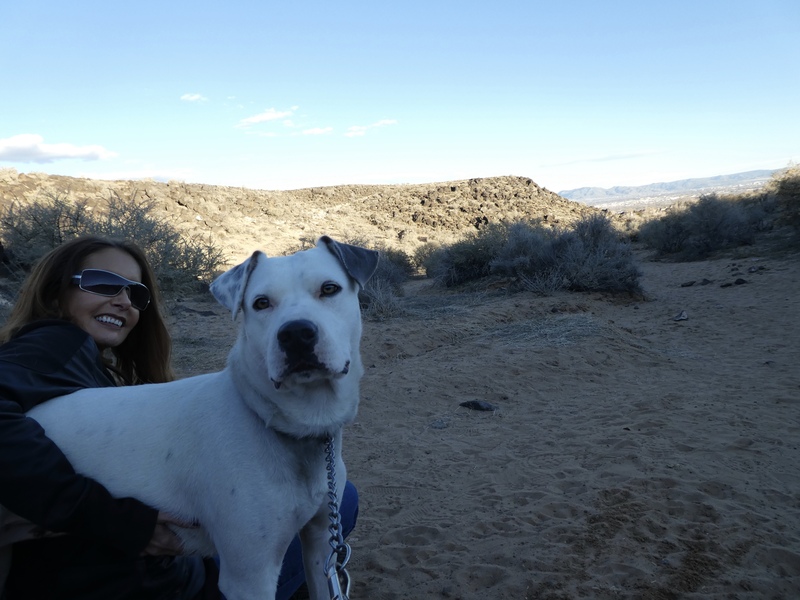 From there we went to one of the trails that allows dogs. Here we go. 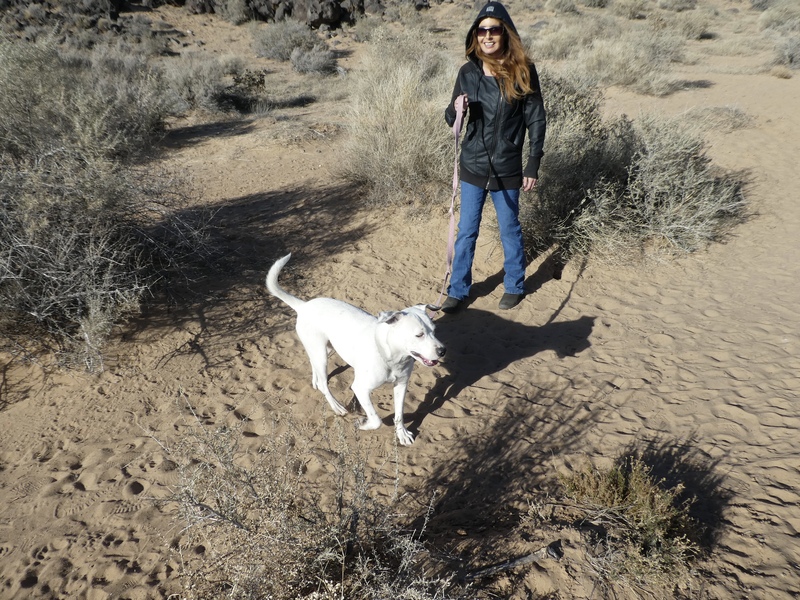 Chloe and her human mom, also Soapy’s mom, are ready to start. We are on Piedras Marcadas Trail. There are petroglyphs up there. Yellow. 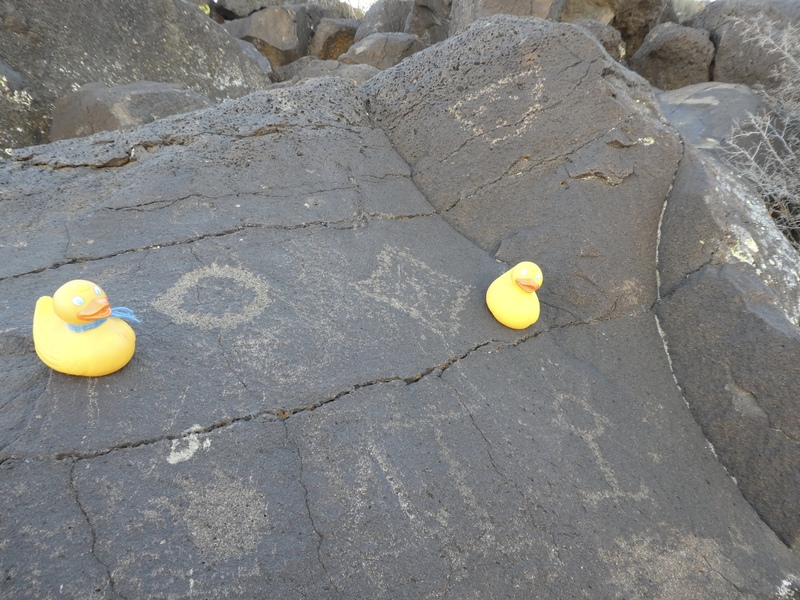 Maybe for the Colorado Traveling Ducks, but about 700 years before us. Here is another closer to us. We followed a trail up this hill. 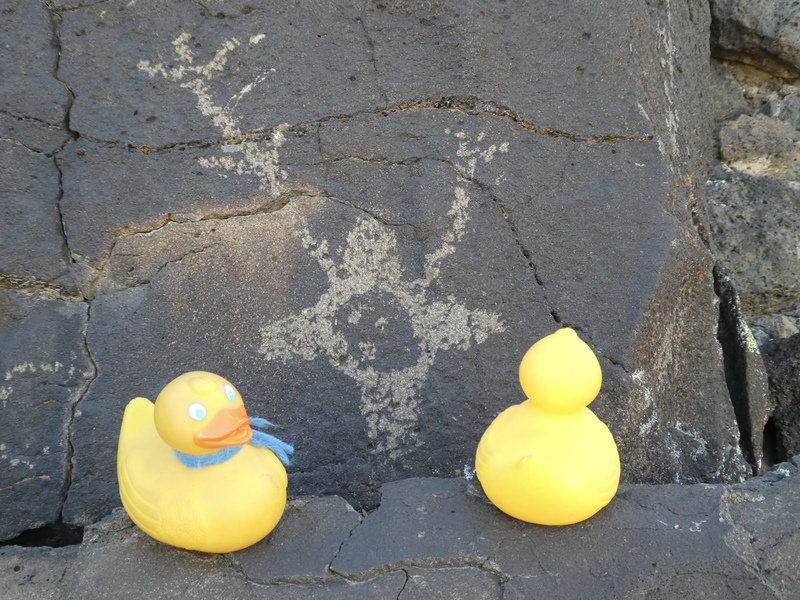 But, as you can, these petroglyphs are almost in somebody’s back yard. Here is another that we liked. 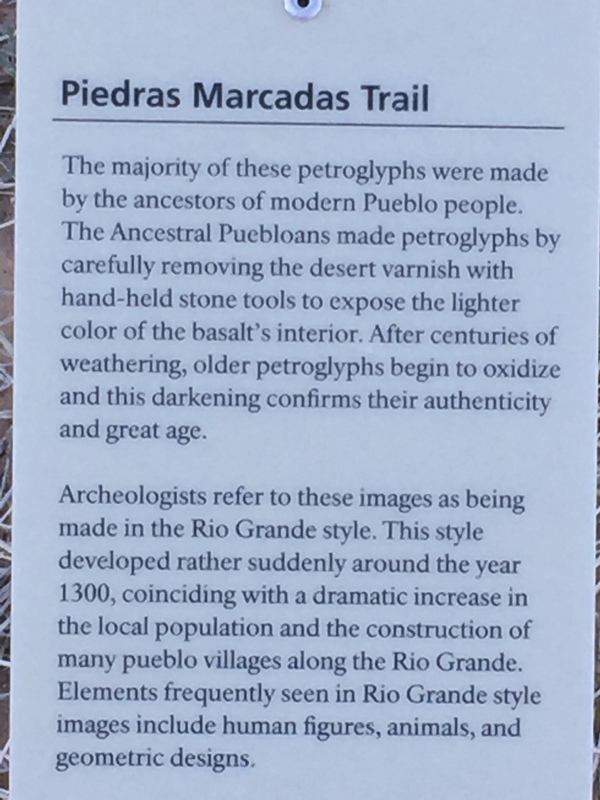 This sign explains a little about these petroglyphs. 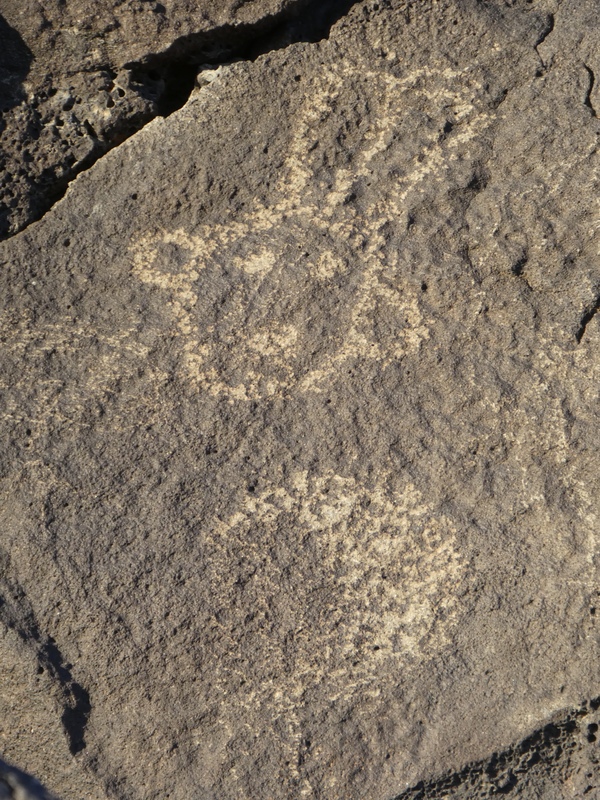 This petroglyph seems to show a human with rabbit ears. 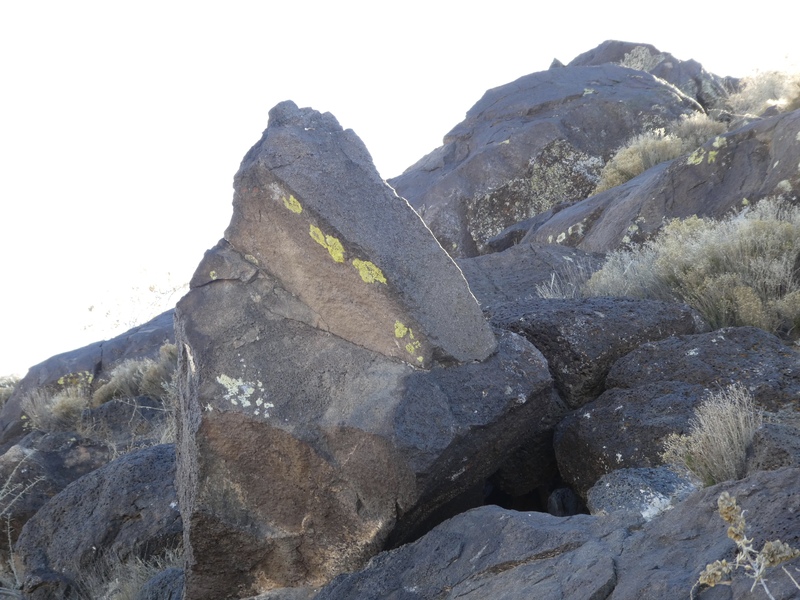 We did see some giant rabbits running through the petroglyphs. Maybe their ancestors were here 700 years ago? There are so many petroglyphs in this area. But this is the last one we will show you. 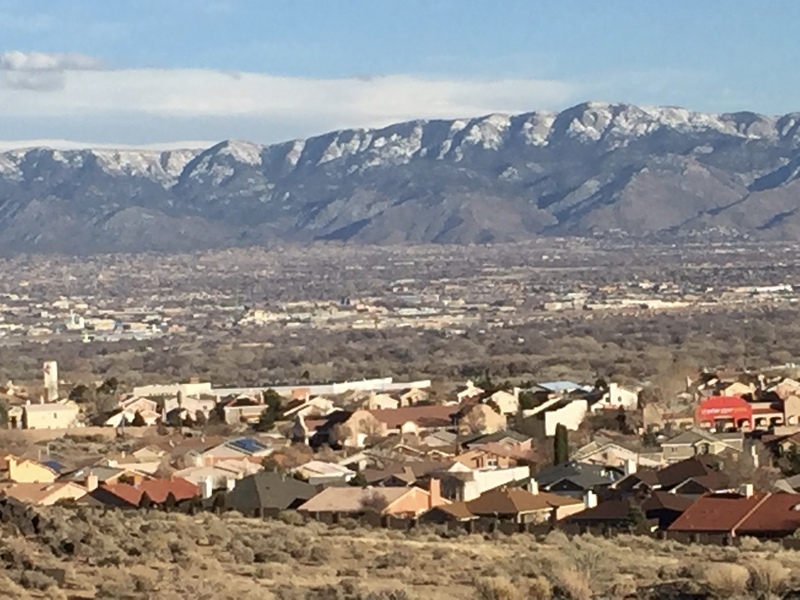 New Mexico has beautiful, blue skies. 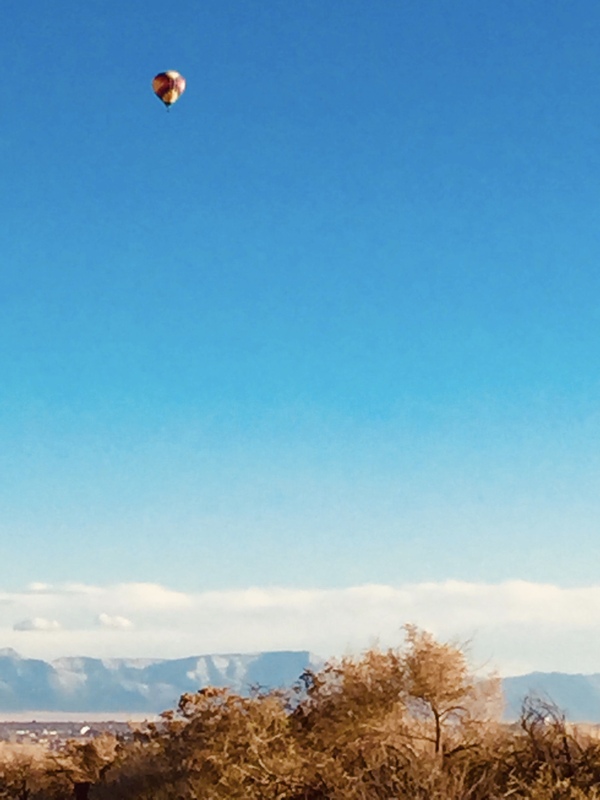 New Mexico is known for hot air balloons. There is a huge hot air balloon festival here in Albuquerque in October. So we had to share this photo, from our February trip, of this lone hot air balloon, soaring above. 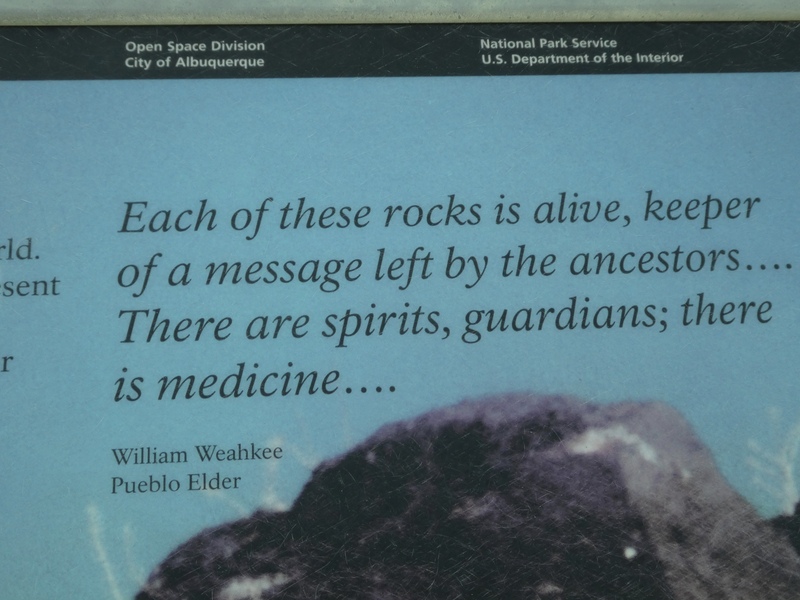 We took this from Petroglyph National Monument. 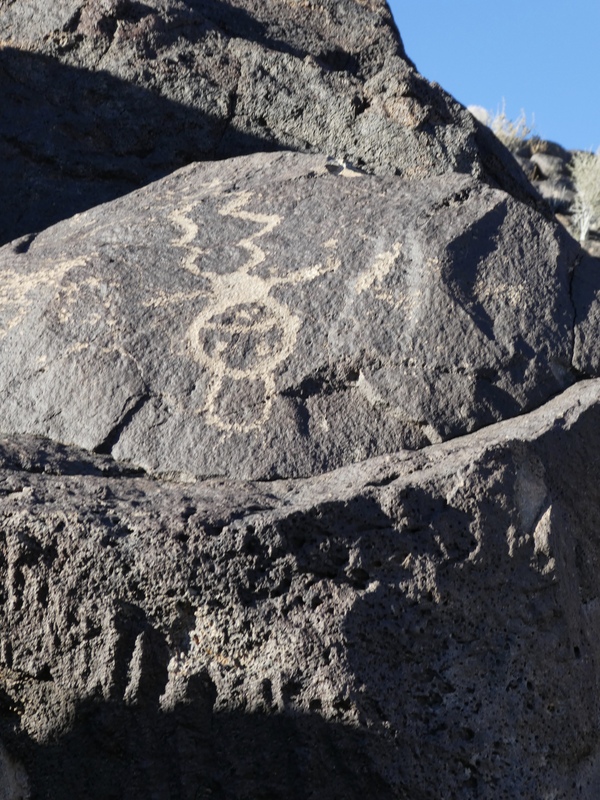 If you visit Petroglyph National Monument in Albuquerque, New Mexico, you will see interesting petroglyphs. The humans and ducks had fun and Chloe, the dog, also loved it.